The crisis at the financially-crippled Championship club took a new twist on Thursday when they postponed Sunday's fixture with Sheffield Eagles and 24 hours later they officially went into administration. A statement from the club said: "The board has been advised that there is no realistic option available to the club, other than to appoint an administrator as a priority to help secure the long-term future of Widnes Vikings. unable to avoid this situation." The club revealed that board members have received death threats, as well as threats to their property and families, which have been passed on to the police. 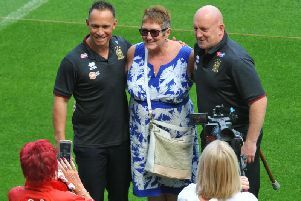 O'Hara, who fronted a press conference at the Halton Stadium on Friday lunchtime, said there is a real danger that Widnes could go into liquidation if he does not receive investment by next week. He said the situation was drastic, with under £1,000 in the bank, and the threat of a 12-point deduction hanging over the team for breaching Rugby Football League insolvency regulations. Football manager Phil Finney, who also sat in on the press conference, said the Widnes players were paid on Thursday but insurance issues are preventing the club fulfilling their fixture list. O'Hara said: "Unless a deal is found by the end of next week it will be difficult for the club to play another game." The administrator admits selling players is an option. He says he has had contact from agents but received no approaches yet from clubs. O'Hara said: "Looking at it realistically with the 12-point deduction, the rest of the season is about hanging in there and building for the future. "The future of the club is through the academy and not the established players. "We're not here to asset strip in any shape or form, but there may well be an instance where players have to be sold. "We want to keep that to a minimum but that has to be an option." Widnes are one of the original 22 clubs that broke away from the Rugby Football Union in 1985 to form the Northern Union, which went on to become the Rugby Football League. The club were dubbed the "Cup Kings" after reaching Wembley seven times in 10 years from 1975 to 1984 and in 1989 were crowned world club champions after beating Canberra Raiders 30-18 at Old Trafford. Widnes went into administration in 2007 after failing to win back their place in Super League following relegation 12 months earlier. They were restored to the top flight in 2012 as part of a franchise system but were victims of the Super 8s Qualifiers in 2018 when they won just one of their seven fixtures and were relegated once more.